Today marks the release of Gears of War 2: The Soundtrack, featuring the score that Steve Jablonsky composed for Epic's already mega-selling game. Last week I won the single-player campaign and a few days later an advance copy of the CD arrived in the mail. I've been listening to it non-stop ever since! It's also now a proud addition to my iPod, and I had it blaring out of my car's stereo on the way to and back from rehearsal for Oliver Twist last night. Many of y'all know how this very blog ended up the focal point for the drive and petition to see a release of Jablonsky's score for the movie Transformers and I was honored to be able to write up the first review anywhere of that soundtrack. So pretty much everyone knows that I'm a huge fan of Steve Jablonsky and his work. Well folks, I gotta tell ya: as much as I loved his Transformers music, Jablonsky's score for Gears of War 2 might be even better! Why is that? I thought the music for Transformers brilliantly evoked the sense of majesty and raw power of the Autobots and Decepticons. "Arrival to Earth" is still one of the most-played tracks on my iPod, and I continue to be haunted by the utter alien-ness that Jablonsky brought to his track "Decepticons". Many times I have said that Jablonsky's music was one of the bigger reasons why Transformers the live-action movie finally brought the whole concept to the level of maturity that it deserved to be at and could at last be appreciated for by the widest-possible audience. Okay well, that's doing music for big robots. It's something else altogether to compose for the human condition. Especially one that covers such a spectrum of emotion as the Gears of War mythos. But here again, Jablonsky has triumphed immensely. And then there is "With Sympathy". If you've played the game then you probably know which part of the story this piece is from. I've played it three times now. And that's as much as I can really bear to listen to it so far, it has so darn nearly brought me to tears. Of all the tracks of music from Gears of War 2, "With Sympathy" is the one that brings the whole thing from the level of mere "video game" and takes it into territory that only movies like The Empire Strikes Back have enjoyed. Jablonsky poured his heart and soul into "With Sympathy", making it a grief-stricken aria of despair and brutal necessity. It is an overwhelmingly heart-rending work. For this one track alone, Jablonsky deserves a wazoo-load of awards. The other track that I think is going to be a favorite is "Finale", the music from the last scene of the game as Marcus and Delta Squad are beholding their handiwork, as we listen to the Locust Queen talking about unintended legacies... which is no doubt a hint of what is to come in a future installment. 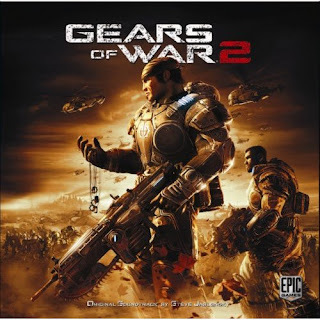 Gears of War 2: The Soundtrack should be at your friendly local electronics and entertainment store, or you can purchase it from Amazon and it's on iTunes as well. This one's destined to be a classic, folks. Highly recommended not just for fans of Gears of War, but for all fans of Steve Jablonsky and every earnest soundtrack collector. And if you want to know more about Steve Jablonsky and his work on Gears of War 2, check out this in-depth interview conducted by Music 4 Games.